OTTAWA - The Harper government is proposing a new retirement benefit to help stave off old-age financial hardship for some of Canada's most severely disabled soldiers, addressing a long-standing concern of veterans' advocates. 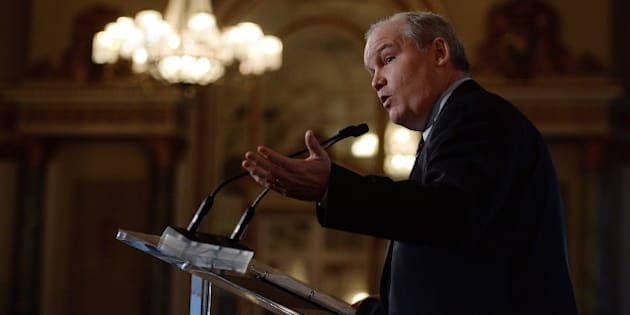 The benefit would provide wounded troops with both serious and moderate injuries a monthly income support payment beginning at age 65, Veterans Affairs Minister Erin O'Toole told a news conference Monday in Toronto. The veterans' ombudsman released a report in October 2013 that found more than 400 severely disabled veterans, mostly from Afghanistan and recent peacekeeping missions, don't receive certain allowances or a Canadian Forces pension, and lose their disability income replacement at retirement. The proposed new benefit, which would close that gap, is one of a series of steps the Conservatives plan to take during the next month to help repair their frayed relationship with the veterans community. "The government recognizes that moderate to severe service-related injuries can permanently affect the veteran's ability to work following their service and earn enough money to save for their retirement beyond their working years," O'Toole said. The benefit is intended to make sure an eligible ex-soldier receives a total annual income of at least 70 per cent of his or her pre-retirement income. It will, however, be calculated on a case-by-case basis and take into account how much the veteran received before 65, as well as other sources of income. O'Toole also said the retirement stipend would extend to families through a payment after the veteran dies. Veterans Affairs estimates that by 2020, approximately 5,800 veterans and survivors would qualify for the new benefit, which still needs parliamentary approval. The gap is one of the unintended consequences of the new veterans charter, the marquee legislation the Harper government has championed since it was enacted in 2006 after being introduced by the Liberals. Veterans ombudsman Guy Parent flagged the issue of old-age poverty for the wounded when his office conducted an exhaustive analysis by comparing the charter to the old system of compensating veterans under the Pension Act. Parent's report was largely restricted to the plight of the most seriously wounded, but the government's plan covers a wider scope. The fact that the charter is, in some cases, not as generous as the old system is the subject of a court challenge by disgruntled Afghan veterans, who've argued that they are being discriminated against. Parent was understandably pleased with Monday's announcement, and urged MPs to pass the new entitlement. "If Veterans Affairs Canada follows through on eligibility, this will be a game-changer for Canada's most seriously injured veterans and their families," he said.